In this second tutorial, we’ll explain a more complete application in order to gain a deeper understanding of developing with Phalcon. INVO is one of the sample applications we have created. 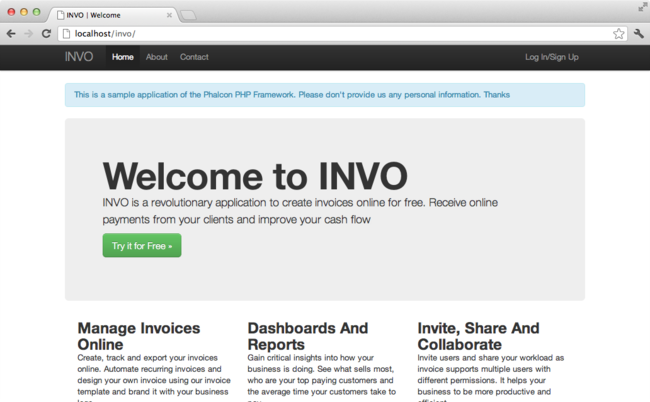 INVO is a small website that allows users to generate invoices and do other tasks such as manage customers and products. You can clone its code from Github. 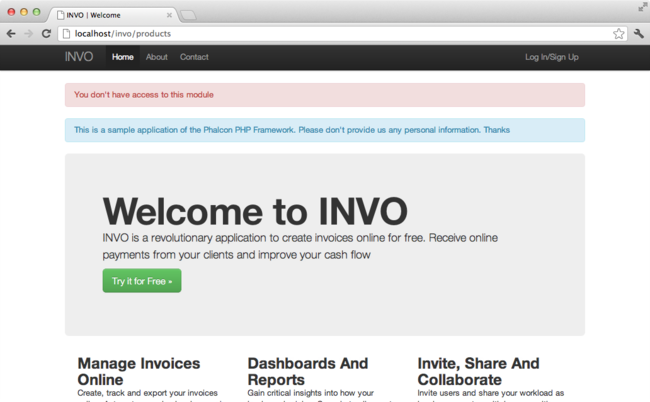 INVO was made with the client-side framework Bootstrap. Although the application does not generate actual invoices, it still serves as an example showing how the framework works. As you know, Phalcon does not impose a particular file structure for application development. This project has a simple MVC structure and a public document root. The application is divided into two parts: a frontend and a backend. The frontend is a public area where visitors can receive information about INVO and request contact information. The backend is an administrative area where registered users can manage their products and customers. INVO uses the standard route that is built-in with the Router component. These routes match the following pattern: /:controller/:action/:params. This means that the first part of a URI is the controller, the second the controller action and the rest are the parameters. The following route /session/register executes the controller SessionController and its action registerAction. Phalcon doesn’t have any pre-defined settings convention. Sections help us to organize the options as appropriate. In this file there are two sections to be used later: application and database. The autoloader registers a set of directories in which the application will look for the classes that it will eventually need. Another file that is required in the bootstrap is (app/config/services.php). This file allows us to organize the services that INVO uses. We will discuss this file in depth later. In the first line of the code block above, the Application class constructor is receiving the variable $di as an argument. What is the purpose of that variable? Phalcon is a highly decoupled framework so we need a component that acts as glue to make everything work together. That component is Phalcon\Di. It’s a service container that also performs dependency injection and service location, instantiating all components as they are needed by the application. There are many ways of registering services in the container. In INVO, most services have been registered using anonymous functions/closures. Thanks to this, the objects are instantiated in a lazy way, reducing the resources needed by the application. Here, we have the freedom to change the adapter, perform additional initialization and much more. Note that the service was registered using the name session. This is a convention that will allow the framework to identify the active service in the services container. A request can use many services and registering each service individually can be a cumbersome task. For that reason, the framework provides a variant of Phalcon\Di called Phalcon\Di\FactoryDefault whose task is to register all services providing a full-stack framework. It registers the majority of services with components provided by the framework as standard. If we need to override the definition of some service we could just set it again as we did above with session or url. This is the reason for the existence of the variable $di. A log in facility will allow us to work on backend controllers. The separation between backend controllers and frontend ones is only logical. All controllers are located in the same directory (app/controllers/). To enter the system, users must have a valid username and password. Users are stored in the table users in the database invo. Here, we return an instance of the MySQL connection adapter. If needed, you could do extra actions such as adding a logger, a profiler or change the adapter, setting it up as you want. Instead of using raw PHP as the previous tutorial, we started to use Volt. This is a built-in template engine inspired by Jinja_ providing a simpler and friendly syntax to create templates. It will not take too long before you become familiar with Volt. For the sake of simplicity, we have used sha1 to store the password hashes in the database, however, this algorithm is not recommended in real applications, use bcrypt instead. Note, the use of ‘bound parameters’, placeholders :email: and :password: are placed where values should be, then the values are ‘bound’ using the parameter bind. This safely replaces the values for those columns without having the risk of a SQL injection. Every time someone attempts to access any controller/action, the application verifies that the current role (in session) has access to it, otherwise it displays a message like the above and forwards the flow to the home page. Now let’s find out how the application accomplishes this. The first thing to know is that there is a component called Dispatcher. It is informed about the route found by the Routing component. Then, it is responsible for loading the appropriate controller and execute the corresponding action method. We now have total control over the Dispatcher used in the application. Many components in the framework trigger events that allow us to modify their internal flow of operation. As the Dependency Injector component acts as glue for components, a new component called EventsManager allows us to intercept the events produced by a component, routing the events to listeners. The hook events always receive a first parameter that contains contextual information of the event produced ($event) and a second one that is the object that produced the event itself ($dispatcher). It is not mandatory that plugins extend the class Phalcon\Mvc\User\Plugin, but by doing this they gain easier access to the services available in the application. "You don't have access to this module"
Backends usually provide forms to allow users to manipulate data. Continuing the explanation of INVO, we now address the creation of CRUDs, a very common task that Phalcon will facilitate you using forms, validations, paginators and more. When the form is submitted, the search action is executed in the controller performing the search based on the data entered by the user. If the field data type is text or similar (char, varchar, text, etc.) It uses an SQL like operator to filter the results. If the data type is not text or similar, it’ll use the operator =. Additionally, Criteria ignores all the $_POST variables that do not match any field in the table. Values are automatically escaped using bound parameters. A session bag, is a special attribute in a controller that persists between requests using the session service. When accessed, this attribute injects a Phalcon\Session\Bag instance that is independent in each controller. There are many things in the above example that worth detailing. First of all, active items in the current page are traversed using a Volt’s for. Volt provides a simpler syntax for a PHP foreach. A model can have a method called initialize(), this method is called once per request and it serves the ORM to initialize a model. In this case, ‘Products’ is initialized by defining that this model has a one-to-many relationship to another model called ‘ProductTypes’. This method is defined in the model. Now let’s see how the CRUD creates and updates records. From the new and edit views, the data entered by the user is sent to the create and save actions that perform actions of creating and updating products, respectively. All the UI elements and visual style of the application has been achieved mostly through Bootstrap. Some elements, such as the navigation bar changes according to the state of the application. For example, in the upper right corner, the link Log in / Sign Up changes to Log out if a user is logged into the application. This part of the application is implemented in the component Elements (app/library/Elements.php).